Mert's instructions to the guys on the tour was to 'stop shaving' because later on, down the road, a barber would come to our hotel and give them a famous 'Turkish' shave. Well, Fred, Mert, and Jimmy missed that opportunity and now the beards were longer than ever. I must admit that I was enjoying it. Did I mention that in 25 years of marriage, I'd never seen Fred with a beard? But now, the time had come...it was off to the barber! Ta da!! These guys have style! There's the excellent results. The barbers gave them a REALLY close shave. Their skin felt 'like a baby's..little cheek'. These barber shops are common in Turkey, where it's possible to get a shave at a very reasonable price. In the meantime, those of us NOT getting a shave had the opportunity to visit the outside market, not only to gaze but to shop. Our goal - to buy our buddy a gift for $1 or less. There were lots of choices. I bought my buddy, Louise, a pair of socks with an 'Ottoman' design. She bought me wooden kitchen utensils (which I'm still using, Louise). I bought something else too. This lovely lady (below) was selling hand-knitted socks that I had to have. Even without a common language, I felt that we connected. These frames hold honeycomb filled with natural honey. I would have loved to bring this home but, laws and practicality aside, it would have ruined my Rick Steves' tote! 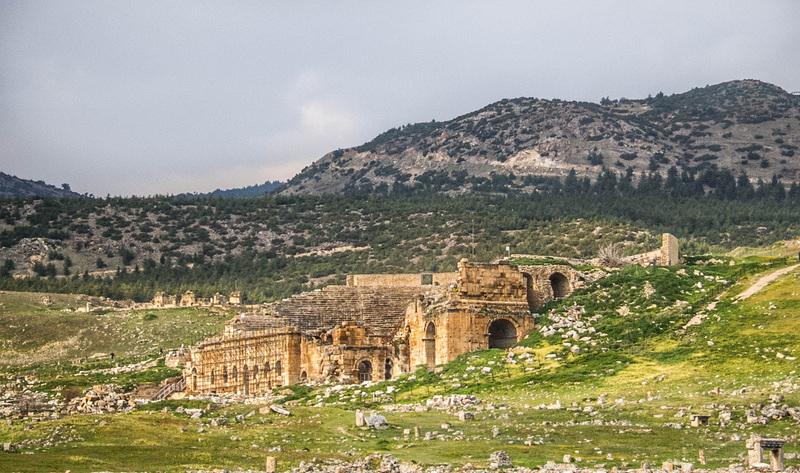 From the market, we boarded our bus once again and drove off on our way to Hierapolis. Wise choice of burial location - spectacular view! Here's the view from the top of the cliffs overlooking the town. Despite the ominous clouds, we never had rain, for which I was appreciative. Mert told us that the hot springs at Hierapolis had been used as a spa to cure ailments for centuries and that many people retired and died here. As we approached the cliffs, we traveled through an extensive cemetery. This was the first time on the tour that we'd been 'up close and personal' with ancient tombs and sarcophagi. 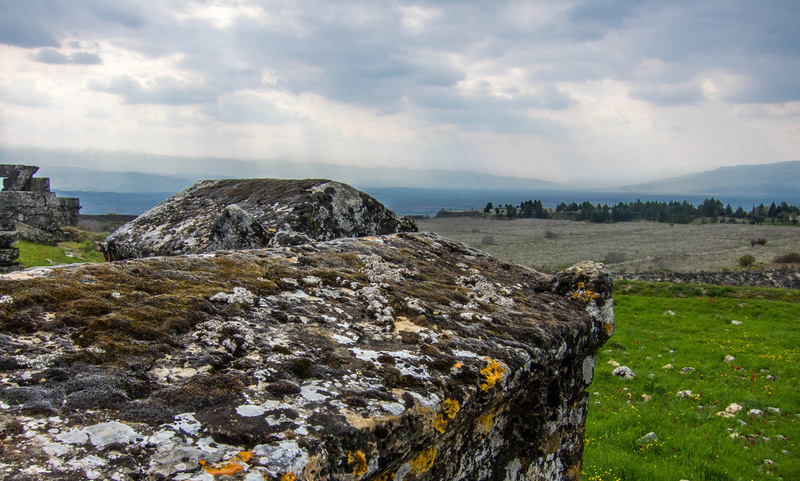 Once a tomb was 'filled', sarcophagi would be stacked on top. 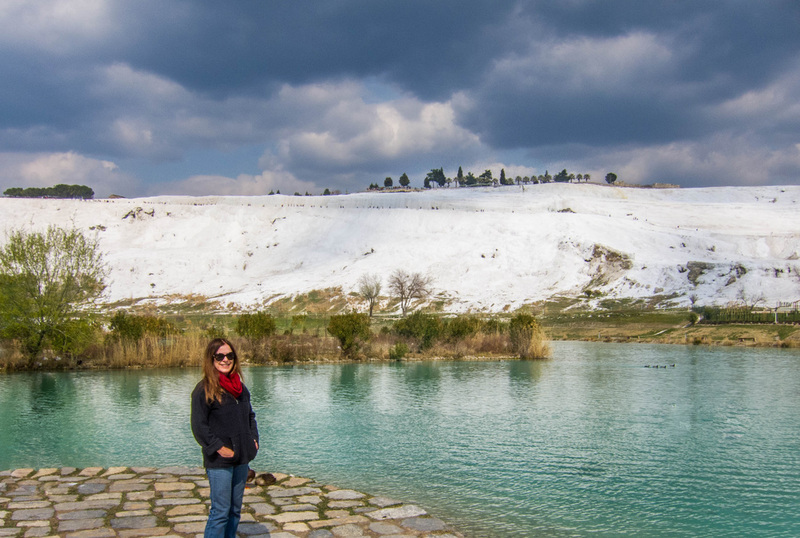 Our next destination was the cliffs of Pamukkale and the hot springs of Hierapolis. We stopped the bus for an view of the cliffs from below. In the distance, we could see a long line of people walking down the hill. That would soon be us. There are still active hot springs in the area that are used today. Here we are without shoes, joining the crowd walking on the travertine terrace. The surface is cold and a bit slippery. Fred got stuck with both pair of shoes. It pays to be the one taking photos. I 'had' to keep my hands free. 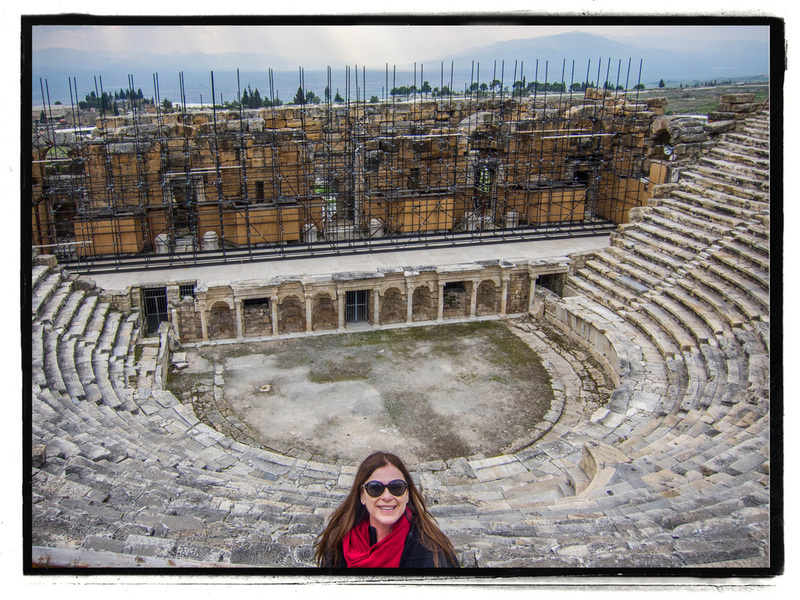 If Hierapolis had an aging community, they must have been in good shape to climb up the hill to this theater. It's not easy. This theater is over 2000 years old. I am continually amazed by the antiquity of all the things we saw.